Liam Neeson is a curious fellow. Back in the day, I knew him pretty well from the roles he was associated in the past, but nowadays he insists on being the white version of Samuel L. Jackson or something…or maybe it’s closer if I just say Nicolas Cage. 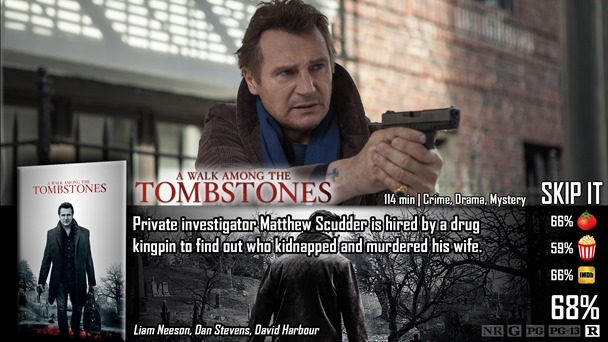 I guess he just has a blast making these types of films – and even though A Walk Among the Tombstones isn’t exactly the same type of film we’ve associated him with – but it’s close enough not to really matter anyways. That being said…it’s still pretty interesting. It stars Liam Neeson as this, surly gentleman that used to be a cop and is now a retired private investigator that just – does things for people sometimes. When he heard about a couple of crooks that kidnap young woman and kill them after obtaining the ransom money, he sets out to lure them into public so he can get his epic Liam Neeson hands on them and stop them from carrying out these dastardly heinous crimes. Hey, I have an idea. Let’s have Liam Neeson play a retired officer of sorts that is after murderous crooks that kidnap girls – and threatens them over the phone. I was being purposefully vague there, but these things do happen in the movie and it’s going to be difficult not to think of Taken because of that. On the other hand, a lot of people associate Taken with hand-to-hand combat – and that kind of fighting almost doesn’t happen in this flick at all – it’s mostly just smart detective work. Now, detective stories I have no problem with, I have a bigger problem with the forgettable aspects of the movie – and there are a few. It’s forgettable because we’ve seen this basic storyline in a lot of other things. It’s a cool take on kidnapping when we learn about how the kidnappers kill the girls anyway (part of the plot, relax) – but it’s not quite enough to make it memorable after all is said and done. The crooks are two-dimensional, disposable characters that only seem to be there to make Liam Neeson’s character more interesting. When you really think about their actions, you’ll realize that they’re pretty dumb in general and should have been caught by this point. We get it, Liam Neeson kicks tail, but if you keep throwing him in these films…we’re going to lose some respect for the man soon. There is also a very strange underlining message about alcoholism that I don’t fully understand. It is weaved throughout the story as if it is supposed to mean something deeper and more thought provoking than it actually does – and you just end up asking yourself why they keep going back to that? It matters for character development and backstory, but going back to the meetings and trudging up the twelve steps in a weird fashion doesn’t make the film any better…it just makes it a little more annoying while we’re trying to focus on the action that’s actually going on onscreen. I won’t lie; the movie is fine if you’re planning to watch it with your TV dinner while you’re bored at home. You won’t get angry at it or complain about everything that happens – you just probably won’t buy it when you see it in the DVD aisle anytime soon. You’ll just say something like – “did I watch that?” and immediately say “maybe, I don’t know. Hey, let’s watch Taken!” Take that as you will. It may not be the best movie in the world, but it keeps your attention and is somewhat fun while it lasts. Detective Liam Neeson is always fun to watch – even if the movie is a little bit of a turkey. The movie is really forgettable. You won’t necessarily get angry at it, but it does seem to be made up with a ton of things we’ve already seen before and it gets old pretty quick.